How will customers find you? Your website must rank on page one of Google for the right search phrases. Our specialist team knows what it takes to get your website to the top of Google drive potential customers to your site. Are you getting enough leads from your website? Are the right customers visiting your site? Unless you're on page one for the right search phrases, you won't get the results your business needs to grow. 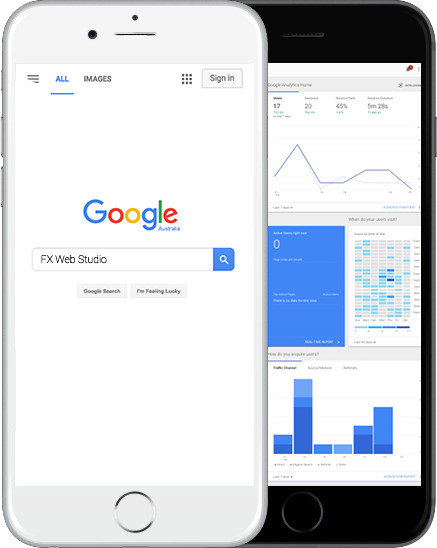 At FX Web Studio, we offer affordable SEO plans to drive the right kind of traffic to your website. Most people do look beyond the first page of search results. Let us get your website to the top of page one of Google for search phrases that your potential customers are using. If you're looking for local customers, or if you want to target customers from a specific area, we can help you. Let us develop and implement a local SEO strategy to attract more customers from Parramatta, Ryde and surrounding areas. Our search engine optimisation strategies will improve your Google rankings and drive the right type of traffic to your website. We will pay close attention to your analytical data to ensure potential customers are visiting your website. We focus on the customer journey. We think carefully about the entire customer journey from searching for your product or service to placing the order or making an enquiry. We work to improve the customer experience on your website and maximise every opportunity to convince potential customers to buy from you. Our SEO strategies has proven successful for our clients with page one results for search phrases with high search volume. We are a company that prioritises quality above all else. We focus on optimising websites with meaningful and relevant content.